A Confucian Constitutional Order: How China's Ancient Past Can Shape Its Political Future, Jiang Qing, Princeton University Press, $39.50. 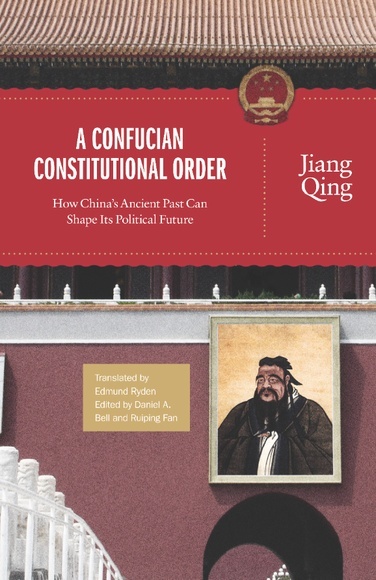 The latest book by prominent Chinese scholar Jiang Qing, A Confucian Constitutional Order is a detailed discussion about the practicality of a Confucian constitutional design in contemporary China. The author proposes a system of government founded on the “Confucian Way of the Humane Authority,” with three distinct and coexisting forms of political legitimacy: of the earth, of the heaven and of the human. Implicit throughout is a critique of constitutional democracy as a form of government, with Qing suggesting “the power of the people” cannot be the only source of political legitimacy. The book is structured explicitly as a dialogue. Jiang leads with detailed descriptions of his vision of a Confucian constitution, describing a tricameral system based on the equilibrium (not equality) of different forms of political legitimacy, an Academy of scholar-officials with a supervising role and a “symbolic monarchy” of direct decedents of Confucius himself. The fundamental premise of the work is the argument that the official embrace of Confucianism in China could become an important part of the solution to China’s “moral and political predicament.” Such discussions demonstrate that while much disagreement remains, ideas about a Confucian constitution could certainly serve at least as a good conversation starter about China’s political future.